Grenadilla wood is one of the most beautiful, durable and stable products of nature—hard, dense and extremely close-grained, capable of being worked to very close tolerances. Acoustically, it is an ideal material, imparting its flexibility to the tonal characteristics of the clarinet that sensitive musicians consider essential to artistic expression. Even a wood as stable a grenadilla “breathes,” absorbing and releasing moisture for decades, even centuries. In stabilizing grenadilla, it is allowed to “settle” and lose its moisture slowly, under the most carefully controlled conditions. The first step is the reduction of the log into “billets”. For the most expensive woodwinds, these billets are obtained by splitting the log by hand so that each billet follows the natural grain of the wood. These are then sawed into rectangular shape, drilled and turned on a lathe into rough form. At this point, Leblanc artisans allow time to take over—often a period of five or more years. When the wood has achieved exactly the right moisture content, Leblanc craftsmen resume the manufacturing processes that lead to the completion of your wood bodied clarinet. Perhaps the most generally misunderstood problem in connection with wood clarinets is that of cracking or checking. It is impossible to guarantee that wood will not crack. Despite it great density, grenadilla, like any other wood, absorbs and releases moisture. It is hygroscopic. Moisture may be absorbed from the player’s breath and from the resulting condensation in the tube as well as from the atmosphere itself. When moisture is absorbed or released too rapidly or unevenly, internal stresses are set up within the wood. If these stresses are too great, cracking or checking can occur. There is evidence to suggest that body acidity from the player’s touch may weaken wood fibers, allowing for more rapid water absorption, which in turn can cause a crack. Some performers may use a dozen or more wood clarinets without a single instance of cracking over the lengthy period of time. No one has devised a method of preventing wood from cracking without at the same time destroying the acoustical properties that make wood desirable as a material for making fine clarinets. When properly seasoned wood is given proper care, the occurrence of cracks and checks is statistically very low—generally well under 1% during the first year with negligible risk thereafter. Even when cracking does occur, only if the cracks extends through the bore (which is very seldom) is the playing quality of the clarinet in any way affected. It is generally advisable to pin and fill a crack so that the chance of the crack spreading are minimized. Breaking in your new clarinet can be the most important step you take in the prevention of developing wood problems over the life of your instrument. I recommend following the below procedure to ensure the best chance of a “slow change” that your clarinet will need to maintain optimum performance and lesson the chances of checking or cracks. 1. Play the instrument for only 15 minutes a day for the first week. 2. Play for 15 minutes twice a day the second week. 3. Add 5 minutes to each playing session until you have reached your regular session length. 4. If you take a day off during the first few weeks, start the process over again from the beginning. 5. Swab Often! I recommend swabbing every 5 minutes for the first two weeks of the process and then periodically through out the session thereafter. For the best results, use a micro fiber or silk swab. When finished playing, wipe out the sockets with a clean, lint free cloth. (As the sockets usually contain cork grease, do not use your swab for this task). 1. Always swab, disassemble and return your clarinet to its case when not in use. 2. Avoid extreme and rapid changes in temperature. The optimal temperature for a wood clarinet is 65° to 75°. Never play a clarinet that is cold to the touch. 3. Maintain a consistent relative humidity in between playing sessions. The ideal humidity for wood clarinets is 45% to 55%. There are several methods for this ranging from in room humidifiers to in case systems. 4. Occasionally, wipe down the keys after playing with a micro-fiber or other lint free cloth. This removes the acids and oils left on the keys by your fingers and will help prevent premature wear or tarnishing. I’m happy to announce that the newly designed JCII for Bb clarinet and alto saxophone have been getting very good reviews from teachers and students and with more dealers adding it to their product mix, you should begin to see it on the shelf of your local music store starting this fall! What’s different about the JCII you ask . . . While most student mouthpieces offer an medium or medium open tip, the JCII provides the student with a medium close design that, when coupled with the medium long facing curve, allows the student to use a heavier reed from day one. 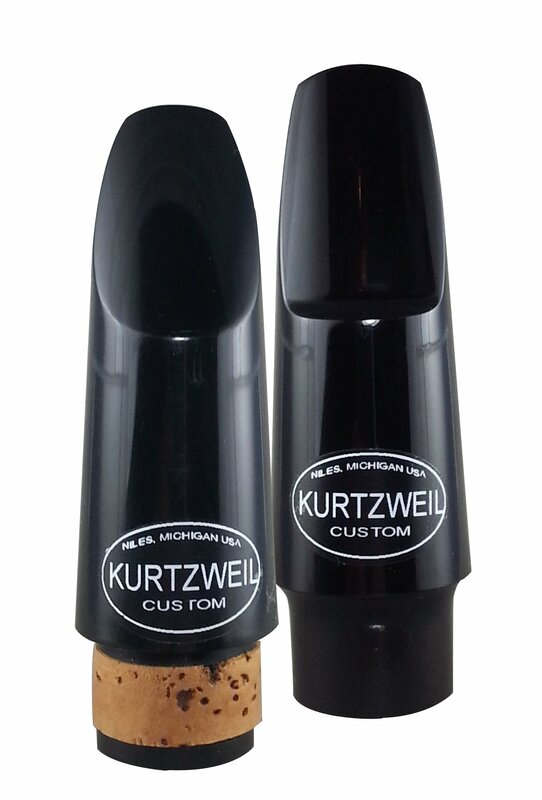 This translates into stronger embouchure development, better intonation and a more centered (characteristic) sound. The chamber of the JCII mouthpieces are more open (A-Frame on the clarinet and oval on the alto) to make the mouthpiece easy to play. With the more open chamber, the student can benefit from the closer tip without having to fight with the resistance or choked feeling of other “close” mouthpieces on the market. The result is a happier, more comfortable young musician . . . and we all know that a comfortable student is one that will stick with the instrument as opposed to getting frustrated an quitting. Both the alto and clarinet mouthpiece are made from an American made, acrylic blank that holds up well for the most abusive middle or high school students and they are hand faced, voiced and reamed to ensure wonderfully consistent performance. To learn more or order <click here>. Also, keep an eye out for the much asked for JCII tenor and bass clarinet pieces coming soon. What Color Is Your Mouthpiece? Core – How dense is the sound? Breadth – How focused is the sound? Vibrancy – Does it project more upper or lower overtones? Of course, we also have to take into consideration how comfortable we are with the piece in performance. When it comes to comfort, I work with clients in three distinct areas. Flexibility – How much freedom does the sound have to alter its character? Resistance – How hard do you have to blow to start the sound? Follow Through – How hard do you have to blow to maintain the sound? As each of us has a particular sound in our head that we want to hear before we even begin to play, it is important to know how differences in our various set-ups can help us achieve that sound with the least amount of effort. As I continue with this article in the days ahead, we will look at how the physical geometries of the clarinet mouthpiece affect each of these 6 important performance attributes. As we head back to school in Michigan, I find myself doing the yearly updating of my teaching syllabi to reflect any changes to curricula or student requirements. As I am doing this, I am struck by the fact that although the literature, methods and scales are different, the basic clarinet accoutrements that I require of my students remain identical whether they are beginners, high school or graduate students. Below is a listing of these items including the rationale behind their requirement. Swab: We all know that playing the clarinet leaves a lot of moisture in the bore and tone holes of the instrument and it is important to not let that moisture pool as it can be detrimental to the bores of wood instruments and the pads on all. With students playing plastic clarinets, I recommend cotton “hanky” style swabs. They are affordable and do the job well. For students with wood clarinets, I recommend micro-fiber. This fabric is softer and less abrasive to the wood bore. 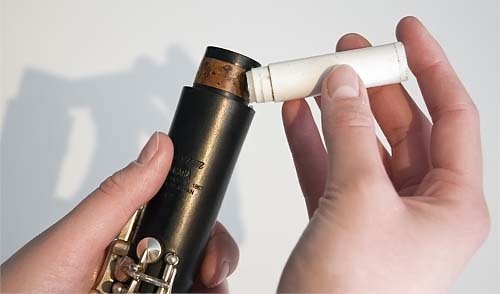 Cork Gr ease: Not only used to facilitate tenon and socket connections, cork grease can help protect the cork from drying and unnecessary wear (both of which will cause leaks and reduce the clarinet’s performance). As all synthetic cork greases are made by the same company and labeled for individual brands, I don’t get too worried about what to recommend. I do believe that organics are better but don’t require “designer” grease of my students. 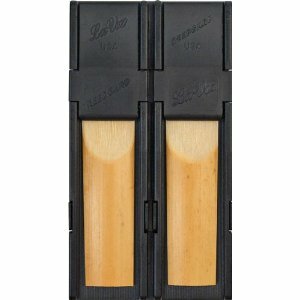 Reed Holder / Case: Each student is required to have at least 4 reeds in his case at a time. To help protect them, a reed guard or case is required. For advanced students, I recommend the “Selmer” style case with the glass plate as I have found that reeds store better and last longer with this type of set-up. For younger players, I recommend a standard La Voz or Rico reed guard. I prefer these to the Vito versions because they offer a flat reed surface. Pencil: Always needed for marking music for practice or performance notes. Manuscript Paper: Granted . . . this likely won’t fit in most single cases but my students do need to have it at every lesson. We use it not only for keeping track of weekly assignments but I tend to write out a lot of specific warm-ups, fingerings and technical drills that the student needs to practice. There are thousands of opinions and much has been written regarding the best way to teach the clarinet embouchure in the first lesson. Since this is the one topic of which I am questioned the most by my band director colleagues, I figured I would throw my opinion into the mix. In a word . . . DON’T! OK, before you delete this article from your inbox and lobby the clarinet world to declare me a heretic, hear me out. There is usually a lot going on in that first lesson and I believe that if we as clarinet teachers get too wrapped up in trying to teach the perfect embouchure, it can more closely resemble a golf lesson (flat lip, chin down, corners in, not too tight, not too loose) than that of a musical instrument. After many years of slow results and incredibly frustrated students, I developed the below approach. I don’t think there is anything about this technique that is a revelation. It is simply designed to give the student one thing on which to concentrate instead of the 50 items of the “golf” approach. Remember that the clarinet is a WIND instrument (not to be confused with a lower lip instrument). Start your lesson by having your students focus their air by blowing at a specific target. Be creative. I like to use a small toy pinwheel with my beginners. It gives them immediate and easy to understand feedback on what their air is doing. We move the pinwheels away from the faces and challenge them to keep them rotating with the same velocity. This gets them to focus and project their airstreams. Next, using the mouthpiece and barrel (yes . . . we already learned how to put them together and apply the reed and lig), I have the students comfortably close their lips around the mouthpieces and blow as if they are still trying to turn their pinwheels. This creates a terrible noise in most cases but get the kids focusing on air right away. Once the kids can comfortably get the reeds vibrating, we begin to “focus” the sound. We start by introducing the idea of blowing a long “HEEE” sound. This lifts the tongue and creates increased air speed. Even with the “HEEE”, we still imagine turning the pinwheel. Finally, once the students can handle keeping the air steady with the “HEEE” tongue placement, I introduce the TOP lip. I instruct my students to grab the top of the mouthpiece with the top lip and hold it firmly while blowing. From here you will begin to see the chins come down and more closely resemble those photo perfect embouchures we see in the method books. This is also the point at which I will begin making adjustments in the angle and placement of the lips on mouthpiece (i.e. bottom lip to the bottom of the curve). Why teach top lip over bottom lip? My answer is two-fold. Concentrating on an active top lip keeps the focus of the sound in the top, forward part of the mouth making for better air speed and tonal control. Because of the way in which the lip muscles are designed, grabbing with the top lip activates the lower lip as well. In most case, when grabbing a mouthpiece (or even your won thumb), the corners will come in. If you drop your chin ,will drop the bottom lip stretches across the teethe. For the majority of single reed players, knowing the tip opening and length of the lay is more than enough information to aid them in their search for the ideal mouthpiece. But the relationship between the length of the lay and the tip opening are not the whole story. The shape of the curve, or slope, at key points along the facing are where the true response of the reed, resistance and initial tonal focus are c reated. To discover the shape of the curve, we use the Erick Brand Method and measure the facing at 5 critical points. 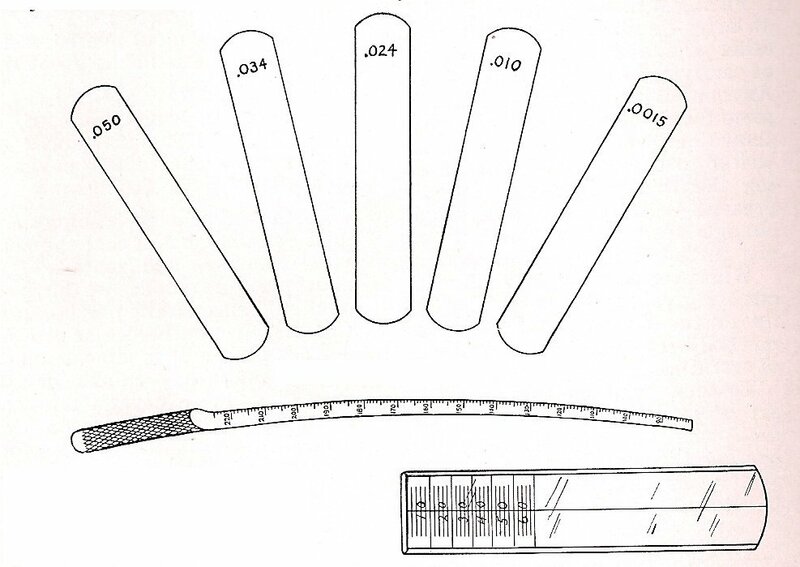 To measure these points, we again rely on the graduated glass plate and feeler gauges. A. Measured with the .0015″ gauge. B. Measured with the .010″ gauge. It is the regions between these measurement points that dictates how the mouthpiece will perform. A to B is a gradual slope and responsible for reed control by lip pressure. B to C is generally called the “resistance” section and contains a point (marked F on the above illustration) that is commonly referred to as the “break” or “pivot”. This is the portion of the facing where the reed leaves the lay under actual performance and is responsible for tonal control. The slope becomes somewhat sharper between B and C.
C to E is the portion of the facing known as the vent. For me, this is the part of the mouthpiece that is crucial to the initial response of the reed and articulation. Now that we have an idea of how the mouthpiece is measured and how each important area of the facing affects performance, lets go back and look at the numbers associated with our 1.06 mm tip with a medium long facing . . . 36-24-12-6-106. 36: Tells us that the facing begins very near 18 mm. 12: Tells us where the resistance ends and the vent begins. We also know that the break is in between 24 and 12. 6: Tells us roughly the halfway point of the vent. A smaller number like 4 would show a straighter vent while a larger number like 7 will show a more abrupt curve. 106: Tells us the tip opening. We’ve all heard the terminology when it comes to our mouthpieces. A player will declare “I prefer a medium tip piece with a longer lay” (facing length). Those further along the clarinerd trail will espouse the virtues of a “36-22-12-6-106” over a “36-24-12-6-106”. These terms and numbers sound abstruse and can be used to impress all of our clarinet friends . . . but what do they mean and why are they important? Since it is the measurement with which most of us are comfortable, let’s start with the tip. The tip opening is the distance between the reed tip and the tip rail of the mouthpiece. It is generally measured in millimeters for clarinets and thousandths of an inch for saxophones. We already know that the more open (greater the distance) a mouthpiece is at the tip, the greater the resistance to and flexibility (softer) will be needed from the reed. We know from previous articles that the lay begins where the facing begins to curve away from the reed table and ends at the tip opening. The means by which most mouthpiece craftsman measure the lay is the Brand method that utilizes prescribed thicknesses of feeler gauges and a graduated glass plate. 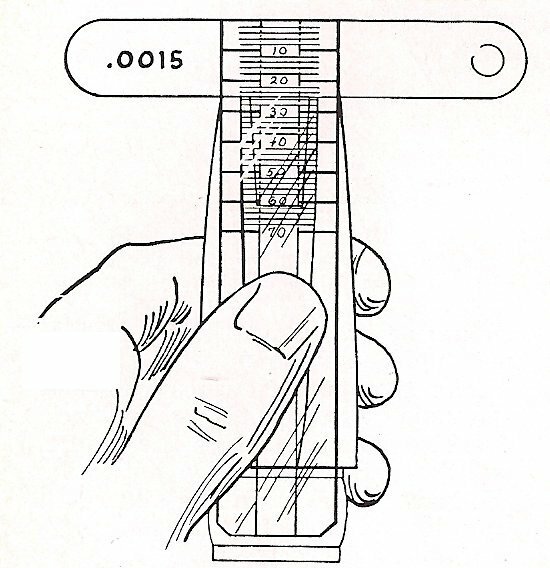 When the zero point of the glass plate is set at the mouthpiece tip, the distance to where the paper thin .0015″ gauge falls represents the length of the lay. The numbers on the gauge represent the length in millimeters doubled. OK. So we have the two anchor points of our mouthpiece measurements. We know that in the mysterious sequence of numbers 36-24-12-6-106 that the 36 represents 18 mm (medium long) length of the lay and 106 is a medium close 1.06 mm tip opening. But what about the 24-12-6? Next we will get into the part of the mouthpiece where the real performance occurs . . . the slope. After I had worked with Jerry Hall for a while learning the basics of mouthpiece measuring, geometry and facing techniques, he told me “You know everything that I know. Now go screw up about a thousand mouthpieces and you’ll be ready”. Needless to say, I learned a great many of the below issues and remedies while destroying those thousand pieces. What a great many players don’t realize is that most of these common “troubles” (as Erick Brand called them) can be remedied in less than an hour at the bench. The most common problem I run into is a crooked facing, especially on older mouthpieces that have warped or twisted reed tables. Chamber is too small or short (Usually from over-facing). Prior to writing this article, I did a little web research to see what teachers are recommending for their students. Unfortunately, the most common reference to student mouthpieces that I found can be summarized as “Try to eliminate all stock mouthpieces. Encourage quality student mouthpieces”. Thanks for narrowing it down so-called experts . . . OK . . . So what constitutes as quality student mouthpiece? To me, a student mouthpiece must . . .
Be comfortable and free blowing: We all know that one of the fastest ways to discourage a kid from playing an instrument is to make him work too hard to get air through the horn. I use a slight A frame in my JCII mouthpieces that allow for greater ease of blowing but still hold the sound. Allow for slightly heavier reeds: Many student mouthpieces feature a short lay and a fairly open tip which make them great for the soft, orange box reeds but too difficult to play as the student progresses. I recommend a medium to medium long lay (17 mm – 18 mm) with a medium close tip (1.06ish). These dimensions allow the student to begin with a “blue” box reed of 2 or 2.5 that will hold the sound while not being too resistant. Provide focused resistance: I teach students to feel the sound in the front of their mouths which requires a mouthpiece to offer enough “positive” resistance at the tip for the student to feel secure. Even longer faced mouthpieces that can be used with heavy reeds, in my mind, are too flexible for the beginner. I prefer to allow students the flexibility once they have a grasp of a good sound/air relationship. Be affordable: Convincing a parent to swap out the “perfectly good” mouthpiece that came in the rental or new clarinet he just purchased can be a challenge. All the better if it is not overly expensive. The tipping point for most parents in my area is $35. So what fits the bill? Below are mouthpieces that I believe match up well with what I look for for my students. Even though I make my own, I feel comfortable when a new student comes to me with any of the below. To clean or not to clean. That is the question I likely get asked the most when giving clinics. The answer is of course . . . Clean. No matter how well you rinse your mouth prior to playing, there will still be a build-up of proteins and minerals inside the mouthpiece when your session is completed. Over time this build-up can not only be create an unattractive white crust (or worse), but can also change the interior geometry of your mouthpiece. These changes can affect response and pitch more than you might imagine. I once had a young student who could not play up to pitch to save her life. After working on air focus, tongue placement and embouchure, I finally looked through the bore of her mouthpiece and discovered a clogged mess that would frighten even the most experienced plumber. After several vinegar treatments and some serious excavation, she could finally find her way to 440. (I may also suggest that her overall health improved after removing the proverbial petri dish from her piece). The moral of the story? Simple daily cleanings will help you avoid becoming “that girl”. Below is a list of Dos and Don’ts that I’ve collected over the years. These will not only help you keep your piece in excellent performance shape but help prevent premature problems. DO: Rinse mouthpiece at least once a week with lukewarm water and maybe a bit of soap to cut through the proteins. DON’T: No matter how tempted you are to get that mess clean, do not use hot water. The temperature can cause the hard rubber from which your piece was made to shift or warp. DO: Use a very soft cloth (micro fiber ) to provide a bit more scrubbing power if needed. Sometimes a SOFT bristled toothbrush works as well. Just be careful to keep the head from striking the walls or baffle. DON’T: Use any product called mouthpiece brush sold in care kits. These have bristles that are far to hard and the unprotected, wire stem is just a major scratch waiting to happen. 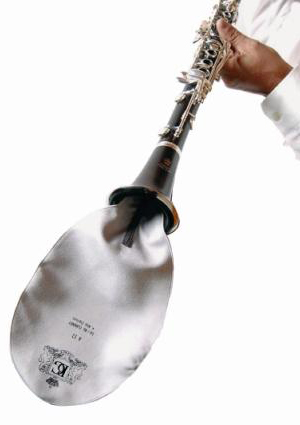 DO: Allow your mouthpiece to air dry after cleaning or playing. DON’T: Run a swab through the mouthpiece to remove any excess moisture. Continual swabbing can erode the interior of the mouthpiece causing a change on response, color and intonation.